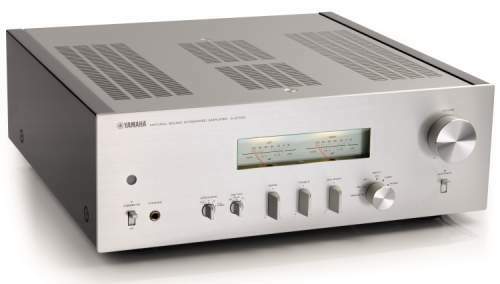 The basic model of Yamaha integrated amplifier with four digits in the new iteration brings attractive VU meters on the front panel, excellent build quality and plenty of power under the hood. Integrated Amplifier A-S1100 was presented last year as a successor to the A-S1000. It is the basic model in the middle class of Yamaha amplifiers, which are of the weaker models differ in the four-digit mark, site of massive wooden casings and serious technical solutions “under the hood”. As already mentioned, Yamaha did not change design direction since the appearance of the model S2000, and we believe that for this there is no need because he realized visual brand recognition. A-S1100 delivers remarkable spirit of retro-luxury and art lovers at the awe-inspiring due to their size and weight of over 23 kilograms. The first change over its predecessor is visible on the aluminum front panel of five millimeters thick, which is now dominated by the centrally positioned dual channel VU meter. The commands for correction of the sound are lowered slightly lower, but maintained the characteristic rectangular shape. On the right, a large part of the rotary commander to control the volume, and there is a small circular selector of the active inputs, while on the left side of the stored command to select the speaker pairs (A, B, A + B and OFF) and the modalities VU meters (VU, peak and off), and switch off. In addition, there are still key to “mute” and 6.35-mm headphone output. The last panel of this amplifier is equally impressive, thanks to the exceptional quality of all connections. Speaker terminals are extremely massive and completely made of metal with gold plated, and the distance is such that it can effortlessly connect and most cumbersome cables. In addition, two pairs of terminals for the speakers are mounted on the left and right ends of the rear, thereby further facilitate access, which in a device of this size and weight is not insignificant. In the central part located four line inputs and one output for recorders, as well as a phono input with a switch to select MM or MC cartridges and a screw for earthing. In addition, there are input and preamp output of the power amplifier, and all RCA connectors are gold plated and very solid. On the right side of the rear panel above the IEC socket for power cable, there is a switch to turn on automatic standby system which is quite practical option, and next to it are stored trigger input, output and input for remote control other Yamaha devices and service connection. The interior has been applied symmetrical design, which is known from model A-S2000. At the front is located EI transformer, a central position occupied by four electrolytic capacitors Nippon Chemi-Con of the 18.000 microfarad. On the left and right side, behind the wood paneling, there are large coolers, which are arranged along the printed circuit board with MOSFET transistors Sanken MLE20 and placed in the back of the rest of the electronics in multiple printed circuit boards. Although the A-S1100 amplifier draws heavily on the A-S2100, the difference in favor of the more expensive models exist. In addition to the capacitor lower capacity (4 x 22,000 uF at A-S2100), the A-S1100 absent balanced XLR inputs, as well as a switch to reverse the phase. With a well-chosen speakers, really nothing.